The recipe that I am posting today involves process of sprouting. I have always seen amma saying and practicing to consume sprouted dhanya [beans/ pulses] and this is because they are known to be very nutritious and helps in digestion too. We call the process of sprouting as "Kirloche" and the sprouted bean as "Kirlaile dhanya" in konkani. I was less lucky with this task in those initial days of cooking, firstly, I never observed the proper technique when amma used to do it. Secondly, the climate here [extreme summers and extreme winters] didnt't give me the sprouts as expected and overall due to repeated failures I assumed the process to be tough and hence the bean used to sit back in the pantry for days together. But when amma visited me during my first delivery, I carefully observed her way to grow the sprouts. Refer the notes section below the post to know how to sprout any bean**. Since then I have been following her method to sprout them and have never failed in doing so. The easiest and fastest to sprout amongst all beans/dhanya is the green gram or moong bean. We can prepare salad, upkaris/stir-fry, usli and randeyi/curry from sprouted moong. 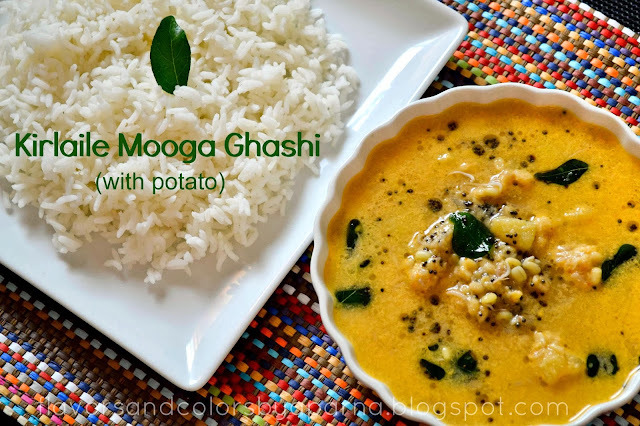 Mooga Ghashi [using moong bean] is a konkani festive dish [as it contains no onion garlic] and favourite of most of the amchis. This dish which is a coconut based gravy can be prepared in combination with yam / raw jackfruit / tender bamboo shoots / potato. Cook sprouted green gram directly in a vessel with salt until soft. Take care not to overcook them. Cook yam cubes separately or in pressure cooker until done. Make a thick fine paste of coconut, red chillies, tamarind. 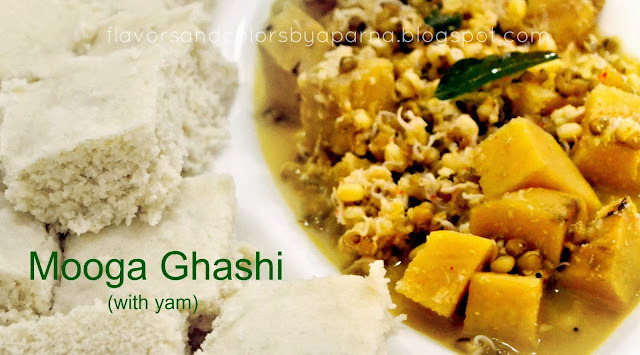 Mix cooked green gram, yam cubes and ground paste in a vessel. Add water to get the desired consistency. [Note that ghashi should not be too watery]. Add salt as per taste and mix well. Allow it to boil on low flame. Meanwhile prepare seasoning. Take oil in a pan, add mustard seeds. Once they splutter add curry leaves, hing and pour the seasoning over the ghashi. Switch off the flame and cover the vessel with lid. I served it hot with sannan [Type of idli]. You can serve it with rice and dosas too. The below pic shows mooga ghashi [prepared at another time] where I have used potato cubes instead of yam and green skins of the bean have been removed after the process of sprouting. Kirlaile mooga ghashi served hot with steamed rice. Wash, clean and soak green gram or any bean in water overnight or atleast for 8 hrs. Ensure that the beans are completely submerged in water. Next day morning wash them again and drain the water. They will be swollen by this time and sometimes slightly sprouted. Tie it in muslin cloth or thin kitchen towel. Transfer the bundle containing the beans in a vessel, place a weight over it or cover the vessel with lid. Keep aside undisturbed at room temperature. After 24 hours you will see them sprouted well and they are ready to be consumed. Wash them well. The green skins can be kept or removed as per your preference. In summer time, I sprout these beans in colander vessel covered with lid [without the use of muslin cloth] kept undisturbed and they sprout faster too when compared to winter season. Use them immediately or store them in fridge in airtight containers.